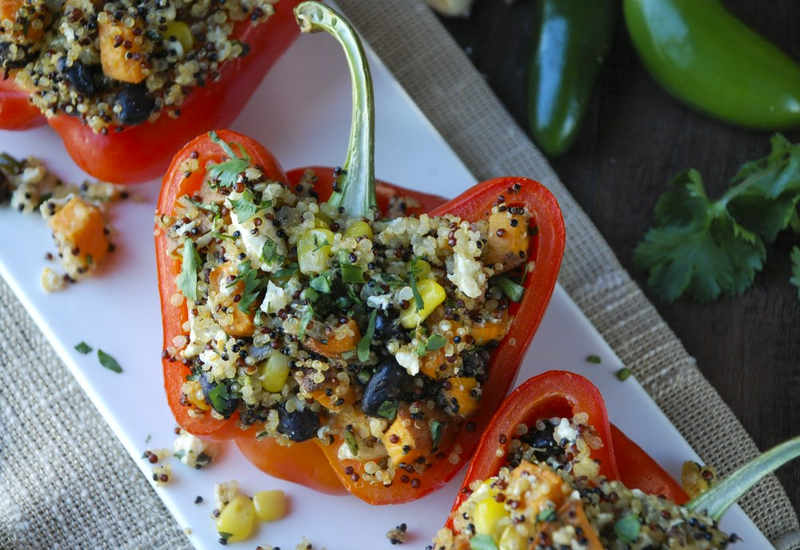 These stuffed peppers are stuffed with protein packed quinoa and a delicious blend of beans and veggies, then perfectly seasoned with cumin, lime juice and cilantro. This is a vegetarian and vegan dish that also happens to be gluten-free! Making stuffed peppers is also a great way to use up leftovers in the fridge at the end of the week. Feel free to throw in your favorite fresh herbs or substitute some of the vegetables with what you find leftover in your crisper. Making stuffed peppers really transforms ingredients into a whole new mealtime experience! Always in a rush at mealtime? You can assemble this dish ahead of time and store in the refrigerator until ready to bake. That way, this becomes a super simple meal that is on the table in under 30 minutes. Per Serving: 480 calories; 21g fat; 56.4g carbohydrates; 20g protein; 21mg cholesterol; 1068mg sodium. First time making stuffed bell peppers and they came out great. This is a fun and easy to way to enjoy good, healthy food. My wife also loved them and was impressed with how they turned out, she would have never eaten a whole bell pepper before! These were also simple to make. These stuffed peppers were delicious! I usually make them with rice, so it was nice to try it with quinoa instead. Nice fall recipe and they were perfect with the pepper jack-o-lanterns I carved for Halloween. These were so yummy!! I ended up with twice the amount of filling than what I needed, but I can’t be mad about it when it’s this delicious!! I got tons of compliments at work and even had someone ask for the recipe and download Mealthy! Score! !